Billiards is a game that has been around for a good, long while. It’s believed to have evolved from lawn games such as croquet, bocce and bowls, when the game moved indoors it was originally played on a table covered with a green cloth to simulate a lawn. It’s thought that the word billiards derives from the French word billart or billette, meaning stick or perhaps for the French word bille, meaning ball. Billards, as a game, has been around since the 1500s. Mary, Queen of Scots, was said to have been wrapped in the cover for her billiard table after her death. Billiards is used as a sort of umbrella term for several games that are played on a tabletop using a cue and a table that has side bumpers and pockets. The bumpers were derived from low walls placed around the tables to keep the balls from flying off and were refined when players discovered that they could bounce the balls off the walls, creating a new aspect of the game. The three main types of billiards are carom billiards – played on a table without pockets; pool, which includes a variety of games played on a table with pockets; and English billiards and Snooker, which require a table with six pockets. With that said, there are many variants of each. Said to have been played by both commoners and kings, the game became associated with gambling and keeping low company. A “pool hall” was the subject of the song “Trouble in River City,” from the musical, “Music Man” wherein it was suggested that it would corrupt youth. Yet it is a game of skill and was sufficiently fascinating that a billiards table often graces a family game room in modern homes. Whether playing against someone else or simply honing skills, a billiard table can be a source of lasting entertainment, requiring hand/eye coordination and even a certain amount of mathematical acumen. Here are ten examples of ways to decorate your game room with various forms of billiards wall décor. With a warn chalkboard background this piece can work on a mass variety of walls. This piece emphasizes the classic line “Rack’em & Crack’em” which is a common phrase in the pool community. It brings out the pool hall feel out in your own billiard room and promotes that gaming atmosphere. The wooden board has a racked upset of pool balls in numerical order. This board is a magnetic board so you can use it for many things. With its bright colorful tone, it will bring light to your basement or game room with ease. The black wooden border allows this art to be placed on a light wooden wall. This rustic piece has two motorcycles parked in front of Bubba’s Billiards next to a gas garage. This piece works well on any wooden wall and brings out the reds in the room from its wooden frame. With the aged look of the piece, it’s a good piece of décor to use to bring back fond memories with friends. This wall mount décor is of a pool ball rack complete with the balls placed inside. The balls have an aged look and are distressed as is the rack. The multitude of colors allows this piece to work with any gaming or recreation room and bring out a lighter environment even if a serious game is currently being played. This classic style pool table has a tradition built into it full of style. Even if your floor is not perfectly level anymore, it’s okay. The pool table comes with a leveler under the table so your surface remains nice and flat. The pocket is leather catches, reducing wear and tear on them and allows things through. 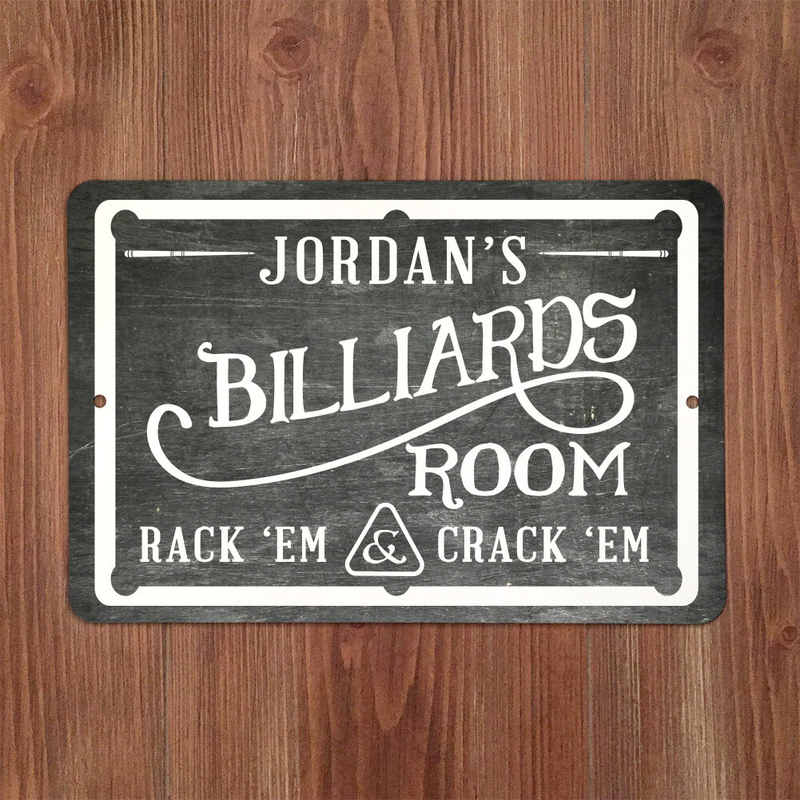 Around a triangle ball set rack, this plaque has old-fashioned billiard balls that are heavily worn with a classic pool cue stick. This piece works well with any older styled rooms or a wooden billiard room. It will also work well with your traditional style pool table and bring a rustic charm to the game room or area. With the eight ball in the center, this clock has the billiard balls and their numbers as the numbers on the clock. With a felt green background it’s almost as if they are sitting on a billiard table. Around the interior diameter is a neon green light to light the clock up in a dark room with a silver finish trim around the clock.